BELIZE CITY, Thurs. July 14, 2016–There have been many reports of Guatemalan laborers being nabbed for incursions and illegal activities inside Belize, but the invisible and presumably well connected hands controlling what is allegedly an organized regime remain elusive, according to a Guatemalan agency which partners with Friends for Conservation and Development (FCD) in Belize to combat environmental crimes in the area. “There is a perverse alliance between poverty and crime. 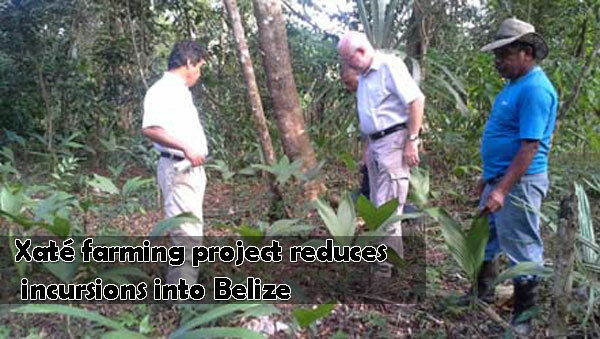 They finance people to come across the Belize border to illegally take [Belize’s] resources. The sad story is that the poor people are in jail, and those who pay, are in the cities. That is one thing we have to change, make those who finance pay for their crimes,” said Bayron Castellanos Romero, executive director of Asociación Balam. Castellanos joined FCD’s executive director, Raphael Manzanero, at a press conference held at the Radisson Fort George Hotel in Belize City Thursday morning. The parties called the press conference to inform the general public about the bi-national efforts which are underway to address Guatemalan incursions into Belize. The parties have extended their cooperation agreement with a new accord spanning 2016 to 2021. According to Castellanos, Association Balam employs an environmental security strategy, which involves projects targeted also at women and youth, to provide alternative livelihoods as well as scholarships for youth, so that they are less likely to fall victims to operators of organized crime. Castellanos said that their NGO works in the Maya Biosphere Reserve in North Petén and also south of Petén, in an area occupied by 350 communities, some of them extremely poor communities which have historically been abandoned by the Government of Guatemala for decades. We asked Castellanos about the history of these settlements along the Belize-Guatemala border, and he told us that they were only settled there within the last 40 to 50 years. The Guatemalan government facilitated their migration there from the southern portion of the country. He told us that the relocation was under the group, Empresa Nacional de Fomento y Desarollo Económica del Petén (National Enterprise for Economic Development of the Petén.) 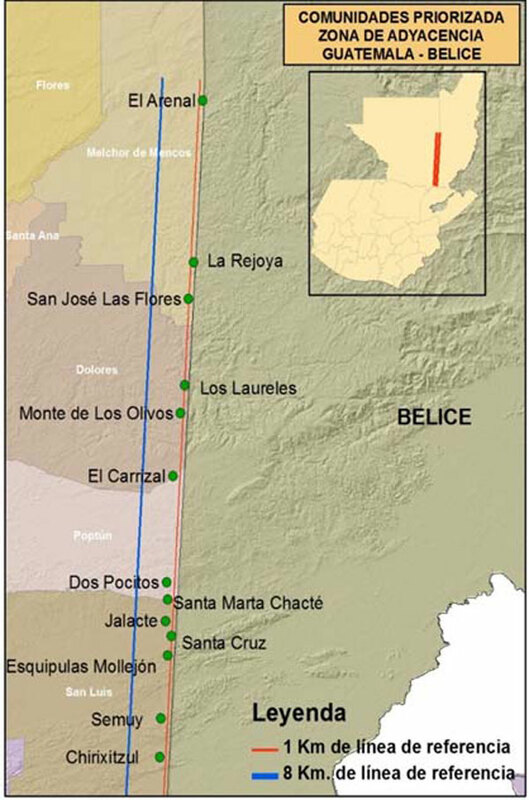 The group was reportedly set up to “develop and colonize” the Peten, but the activities of the communities there have also led to vast deforestation on that side of the border, with clear encroachments into Belize, as demonstrated by maps that have been published by FCD and other sources. Castellanos agreed that significant amounts of the forest in Petén have been disappearing, and they have a direct influence on Belize’s territory, where, he confirmed, that there has been illegal logging, illegal gold panning, poaching, as well as illegal production of agricultural produce and drugs. “The main causes of the influx are poverty and organized crime,” Castellanos said. Guatemalan oligarchs who live miles away in cities finance poor people who are living in villages near Belize’s border with Guatemala to come into Belize to extract our resources, he explained. He said that such general statements can’t be made just because they sound good. “It is not fair to anybody to be making accusations without having tangible facts to support those claims that you are making”, Lovell said. We asked him whether he had heard such assertions having been made before, that the incursions into the Chiquibul in Belize are the problems arising from organized crime. He said that he has “heard talk,” but he cannot be sounding off in that direction without having any sort of facts to support it. He told us that he does not know of any such case where anyone has been indicted on such an allegation. According to Castellanos, his organization implores Guatemalans to not come over to Belize, telling them that Belize has strict laws that they enforce, and they try to dissuade them from illegally exploiting the Chiquibul—the vast majority of which is in Belize. He said that for the past 20 months, there has not been any illegal logging reported in the area. He said that Guatemalans and Belizeans need to work together to address the cross-border problems created by organized crime. We asked Castellanos whether the territorial dispute is a factor in the insistence of some Guatemalans to target the Chiquibul; he insisted that the real motive for the incursions by Guatemalans living along the border is poverty. “The territorial problem is something for our governments to solve. We cannot sit with our arms crossed because of a territorial problem. And that is what has to be solved as soon as possible,” Castellanos said. There was no indication that there were any arrests of those who are allegedly behind the organized crime. According to Castellanos, the Environmental Justice Forum works with the public ministry to investigate persons who finance the illegal activities. They have found that there is a criminal factor that has the participation of ‘bad Belizeans’ and ‘bad Guatemalans’ who sell the patrimony of their countries, and they hope that the arms of the law will reach these people, Castellanos said. We also asked him whether official corruption is involved. Although he did not categorically say that it was, he did indicate that, “there [has been] corruption in the Guatemalan government.” “I don’t know about Belize, there could be, but I can talk about my country and we have detected very corrupt officials. [There is] the former president who is now in jail, ministers who are in jail,” Castellanos said. 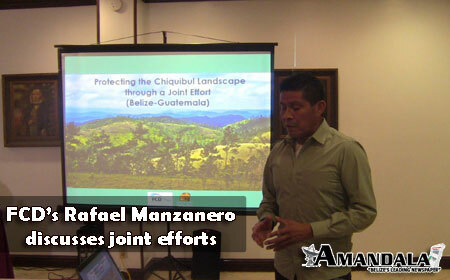 Manzanero again stressed the urgency of dealing with the problems at the Chiquibul. “Here we need to go in an emergency mode,” he emphasized. 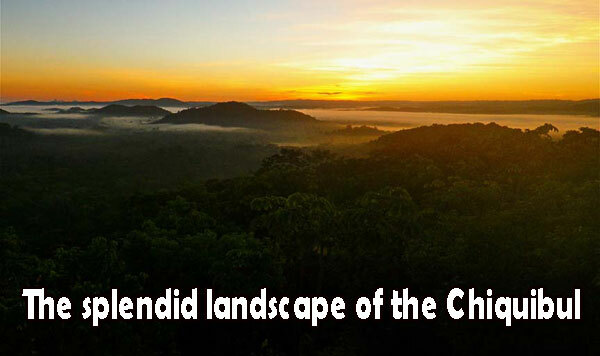 He told us that had a conservation post been erected at Cebada, Belize could have prevented the loss of up to 75 hectares of forest or roughly 186 acres, which was primarily exploited for illegal milpas. As we have previously reported, the area is cleared for planting crops such as pumpkins for pepitos, corn, coffee and other agricultural produce, but also to plant marijuana. A few weeks ago, the Belize Defence Force also reported that they had found 20 Guatemalans living illegally at El Retiro, in the Chiquibul National Park. Manzanero told us today that the Guatemalans had been given an order to leave, but it has not been verified whether they had actually left. Manzanero said that he assumes by now that the Guatemalans would have packed up and left. We were advised on Monday, when we asked CEO Lovell about the matter, that Belize was still awaiting formal confirmation from the Organization of American States (OAS) to confirm that the Guatemalans are on the Belize side of the border. Lovell told us today that the Guatemalans are evidently still there. Back in 2014, the Foreign Affairs Ministers of Belize and Guatemala signed a string of 13 agreements, one of which addressed the Protection of the Environment and Sustainable Use of Resources, which calls for the establishment of a joint coordinating mechanism. An initial meeting has been held and both Castellanos and Manzanero called for the full implementation of the accord. The mechanism is to craft a plan of action, which, among other things, would promote the respect for and enforcement of the environmental laws and regulations of the respective countries. Responding to suggestions that Julio Rene Alvarado—the 13-year-old Guatemalan who lost his life at Cebada, Chiquibul, in April, when a Belize Defence Force team came under fire while trying to stop illegal milpa farming in the area—was a victim of the kind of organized crime highlighted by Castellanos, Lovell said: “I would not want to go there!” He said that the conclusion may be drawn from wrong assumptions. The matter is still under investigation by the Organization of American States (OAS), as well as Belize police, Lovell said. He told us that Belize sticks by its account of what transpired—that the Guatemalan boy was shot when a Belizean soldier fired back in self-defense after the patrol was attacked during a nighttime operation. We asked Lovell if he is investigating this possible angle. He told us that he would have to discuss the matter with his people and see if this is a possible scenario. Matters like these are difficult to prove, unless [we] can have evidence to see who is involved and see who is involved on the ground, Lovell told us.